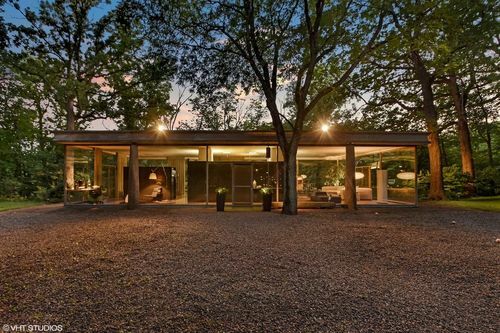 One of the most architecturally significant Mid-Century Modern houses, easily comparable to the Farnsworth House by Mies van der Rohe or the Glass House by Philip Johnson, plus liveable private lower walk-out level facing the ravine. Other glass houses on par are museums. Known as the House on a Bluff, designed by H.P. Davis 'Deever' Rockwell, student of Mies van der Rohe, as his own family residence. A glass pavilion overlooking Butterfield Creek with private lower level living spaces. AIA award 1965. This striking two story glass house on 2.49 acres is unsurpassed in minimalist elegance and modern comforts. Terrazzo floors, 10'6" ceilings, 2 skylights. Workshop, storage etc. Many updates in recent years include the master bath, heat/ac, garage roof, double ovens, cooktop, dishwasher. All curtains for the glass walls are included (not currently installed). Originally 5 bedrooms, now decorated as 3, plus 3 full baths. Very private, secluded wooded setting. Taxes are being contested.